New Japanese Imports, plus a sale! We have a new selection of Japanese fabrics in the store. From fabric lines Kokka, Echino, and more, these cotton and cotton/linen blend fabrics feature unique prints and a modern style. But perhaps the best part: LAST season's Japanese fabrics have now been reduced to 30% off their original price! There are plenty of gems left, so come check them out! We just received a fresh supply of printed cotton toweling from Moda. With colorful fruit and stripe designs, this toweling is sure to freshen up your kitchen with vintage charm. The fabric is 16" wide and hemmed on the edges, so all you need to do is cut it to size, hem the two remaining edges, and it's ready to go! Of course, towels like these would be lovely with a little embroidery thrown in. Stitch shading on the cherry panels or add a linear border. And of course the stripes are ideal for cross-stitch. These fabrics are soft 100% cotton, so they are definitely functional as well as pretty! 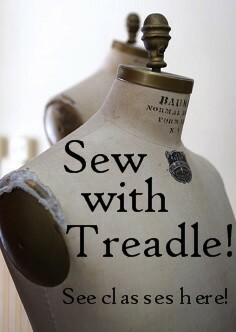 Coming soon to Treadle: Curvy Corsets class! In classic white or splashy colors, corsets are a fun modern accessory or make a great alternative to traditional, dressy underpinnings. A corset is also an essential foundation for historic clothing. Learn to make a Victorian-style corset that’s fitted to your figure. You must have experience making basic garments and be comfortable working from a pattern. Some sewing outside of class may be required. *Class fee includes corset hardware kit. We have some great new knit prints in for summer! Here are just a few. Knits are easy to wear and comfy in any season. With a fun print like this, you can keep the styling simple. Try basic T-shirts, dresses, and skirts for quick sewing and visual pop. There's so much more in our store, from mod and whimsical to sophisticated florals, as well solids in every hue and shade. Our knits selection is truly wonderful this season. Stop by and take a look! Here's a lovely example of what you can do with all the wonderful seersucker fabrics now in stock at Treadle. This sweet summer dress enhances seersucker's textured crinkles with subtle gathers above and below the bust, and the bias trim at the neckline and hem takes advantage of the linear plaid. Seersucker is ideal for summer! So light, floaty, and comfortable in hot weather, it's the fabric of choice for casual skirts, dresses, and shirts for any gender. Treadle Yard Goods has always been a destination spot for fine bridal fabrics, including lovely white and cream lace. But now we also have several bolts of lace fabric in bright, vivid colors! Colorful lace is on-trend this season; mix it with knits for sheer cutouts in designer-style tees, or use as an overlay for skirts and dresses. You don't need much to make a big impact; this bright lace creates its own eye-catching details. We have a huge new group of Brussels Washer from Robert Kaufman. This linen/rayon blend fabric is a dream to work with. It combines the best elements of each of its component fibers: the linen is crisp and firm, while the rayon lends drape and wrinkle resistance. Get all the benefits of linen - with fewer wrinkles! - in this easy-care machine washable fabric. Brussels Washer is a longtime favorite, and Robert Kaufman has recently released an amazing new expanded color palette, so we have more colors than ever before, including the yarn dyed colors, which combine a saturated color with white for more visual texture and a softer tone. This fabric is ideal for dresses, skirts, trousers, and jackets. It's a perfect wardrobe staple. We have an amazing new feather-covered fabric in the store. Soft pink feathers are sewn to a floaty net ground, with bits of silky fringe interspersed between for even more visual texture. Treadlette Rebecca has made a truly wonderful garment in this unique fabric: a smooth, straight skirt that makes the sewing simple and shows off the feathers to best advantage. She added a plain silk waistband to keep the waistline trim. She used McCall's pattern 6608, though any simple skirt pattern would work. Sewing feathered fabrics might seem tricky, but one bonus is that they don't require hemming! Simply trim the net ground (it won't fray!) and let the feathers hang over the cut edge for a soft finish.